Mayor David Condon stands in front of the Spokane River during a 2015 river cleanup day. 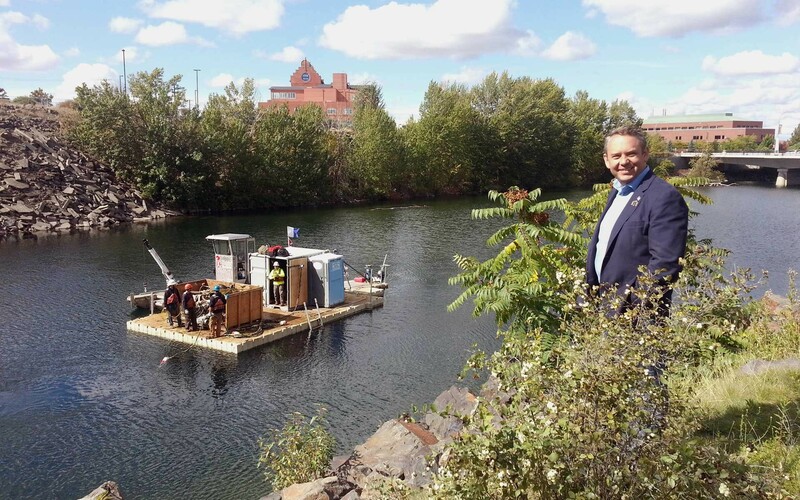 One of Mayor David Condon's most trumpeted accomplishments has been his "Cleaner River Faster" initiative, an attempt to meet strict pollution standards by radically reinventing both the stormwater system and the street design. All told, the plan aims to beautify roadways, reduce water pollution and save money. PCBs can contaminate fish, which can cause cancer when ingested by humans. But city spokesman Brian Coddington urges people to keep in mind the context. For years, the city has been working with EPA, the Washington State Department of Ecology and other environmental groups to develop water quality standards. Washington state's standard was 170 parts per quadrillion. That's such a tiny amount of PCBs that Coddington compares it to "a grain of sand in a beach of sand." It's a figure that the Center for Justice notes is 700 times more stringent than the standards put in place by the 1979 Federal Toxic Substances Control Act. And that's the number Spokane has spent years shooting for, budgeting $340 million for the project. But recently, EPA picked a standard 24 more times more stringent than Ecology's standard for the Spokane River and other bodies of water in the state. "Fast-forward to last November. EPA got involved," Coddington says. "Essentially, it overrode Ecology's standard in favor of its own 7 parts per quadrillion [standard.]" It's still looser than the Spokane Tribe's standard of 3.37 parts per quadrillion, but Coddington claims that standard is actually unmeasurable with current technology. "How is it reasonable for us to be able to adjust and achieve something that can’t be measured?" he asks. Not only that, but the city is already two-thirds of the way to completing the water infrastructure project aimed at the state standard. And with a median household income of only about $46,000, Spokane doesn't have a lot of tax revenue to work with. "A lot of work has gone into making this affordable and keeping utility rates at a very low, affordable, predictable level," Coddington says. He says Condon is asking the EPA to use the state's still-fairly-stringent 170 parts per quadrillion standard. "Which standard do we need to meet?" Coddington says the mayor is asking EPA. "How would we approach getting to a 7-parts-to-quadrillion level? How is it that Spokane should have to comply with rules that are changed two-thirds of a way through the process?" But local environmental activist groups, including the Center for Justice, aren't happy about the mayor's effort. "We need you to email Mayor Condon to ask him not to work to weaken protections for our River," the Center for Justice wrote yesterday on Facebook. "Ask him to work to protect the River, get PCBs out, and not cut backroom deals with EPA that will impact the health of fish and people who use the river." But Coddington says the progress the city has made so far on improving water quality shows the city's commitment to improving water. "This is the something that the city — because of the love and passion for the river — has taken on," Coddington says. "The city of Spokane has been a national leader in this area. The city has won awards for water quality." Are mushrooms the solution to one of Spokane's most nagging pollution problems? A local environmentalist dies suddenly. Plus, a semantic school argument. The Sierra Club steps into the fight to clean the Spokane River.